Rita Levi-Montalcini, a biologist who conducted underground research in defiance of Fascist persecution and went on to win a Nobel Prize for helping unlock the mysteries of the cell, died at her home in Rome on Sunday. She was 103 and had worked well into her final years. Rome Mayor Gianni Alemanno, announcing her death in a statement, called it a great loss "for all of humanity." He praised her as someone who represented "civic conscience, culture and the spirit of research of our time." Italy's so-called "Lady of the Cells," a Jew who lived through anti-Semitic discrimination and the Nazi invasion, became one of her country's leading scientists and shared the Nobel medicine prize in 1986 with American biochemist Stanley Cohen for their groundbreaking research carried out in the United States. Her research increased the understanding of many conditions, including tumors, developmental malformations, and senile dementia. 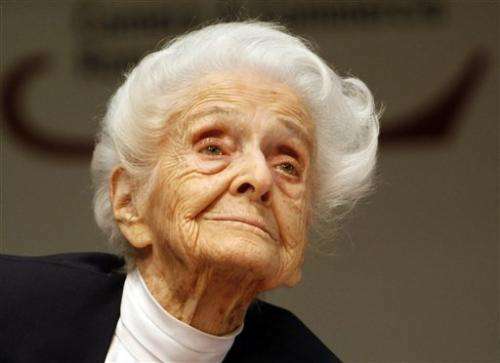 Italy honored Levi-Montalcini in 2001 by making her a senator-for-life. A petite woman with upswept white hair, she kept an intensive work schedule well into old age. "At 100, I have a mind that is superior—thanks to experience—than when I was 20," she said in 2009. "A beacon of life is extinguished" with her death, said a niece, Piera Levi-Montalcini, who is a city councilwoman in Turin. She told the Turin daily newspaper La Stampa that her aunt passed away peacefully "as if sleeping" after lunch and that the scientist had kept up her research studies several hours a day "right up until the end." Levi-Montalcini was born April 22, 1909, to a Jewish family in the northern city of Turin. At age 20 she overcame her father's objections that women should not study and obtained a degree in medicine and surgery from Turin University in 1936. She studied under top anatomist Giuseppe Levi, whom she often credited for her own success and for that of two fellow students and close friends, Salvador Luria and Renato Dulbecco, who also became separate Nobel Prize winners. Levi and Levi-Montalcini were not related. After graduating, Levi-Montalcini began working as a research assistant in neurobiology but lost her job in 1938 when Italy's Fascist regime passed laws barring Jews from universities and major professions. Her family decided to stay in Italy and, as World War II neared, Levi-Montalcini created a makeshift lab in her bedroom where she began studying the development of chicken embryos, which would later lead to her major discovery of mechanisms that regulate growth of cells and organs. With eggs becoming a rarity due to the war, the young scientist biked around the countryside to buy them from farmers. She was soon joined in her secret research by Levi, her university mentor, who was also Jewish and who became her assistant. "She worked in primitive conditions," Italian astrophysicist Margherita Hack told Sky TG24 TV in a tribute to her fellow scientist. "She is really someone to be admired." Italy's premier, Mario Monti, paid tribute to Levi-Montalcini's "charismatic and tenacious" character and for her lifelong battle to "defend the battles in which she believed." Only a few months ago, she helped sponsor an appeal to the government for more attention of fund-strapped young scientists in Italy. Vatican spokesman the Rev. Federico Lombardi praised Levi-Montalcini's civil and moral efforts, saying she was an "inspiring" example for Italy and the world, the ANSA news agency said. An Italian scientist, who worked for some 40 years with Levi-Montalcini, including in the United States, said the work the Nobel laureate did on nerve growth factor was continuing. The protein assists portions of the central nervous system that have been damaged by disease or injury. 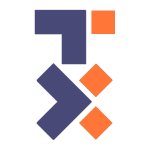 "Over the years, this field of investigation has become ever more important in the world of neuroscience," Pietro Calissano was quoted by ANSA as saying. Calissano began studying under Levi-Montalcini in 1965 and recalled her ability to relate to students on a very human level, with none of the elite airs that often characterize Italian professors. "I remember we were in a closet with cell cultures when she offered me a fellowship," Calissano said. He added that research building on Levi-Montalcini's pioneering achievements continues. "We are working on a possible application in the treatment of Alzheimer's," he added. The 1943 German invasion of Italy forced the Levi-Montalcini family to flee to Florence and live underground. After the Allies liberated the city, she worked as a doctor at a center for refugees. In 1947 Levi-Montalcini was invited to the United States, where she remained for more than 20 years, which she called "the happiest and most productive" of her life. She held dual Italian-U.S. citizenship. During her research at Washington University in St. Louis, Missouri, she discovered nerve growth factor, the first substance known to regulate the growth of cells. She showed that when tumors from mice were transplanted to chicken embryos they induced rapid growth of the embryonic nervous system. She concluded that the tumor released a nerve growth-promoting factor that affected certain types of cells. The research increased the understanding of many conditions, including tumors, developmental malformations, and senile dementia. It also led to the discovery by Stanley Cohen of another substance, epidermal growth factor, which stimulates the proliferation of epithelial cells. The two shared the Nobel Prize for medicine in 1986. Levi-Montalcini returned to Italy to become the director of the laboratory of cell biology of the National Council of Scientific Research in Rome in 1969. After retiring in the late 1970s, she continued to work as a guest professor and wrote several books to popularize science. She created the Levi-Montalcini Foundation to grant scholarships and promote educational programs worldwide, particularly for women in Africa. In 2001 Levi-Montalcini was made a senator for life, one of the country's highest honors. She then became active in Parliament, especially between 2006 and 2008, when she and other life senators would cast their votes to back the thin majority of center-left Premier Romano Prodi. Levi-Montalcini had no children and never married, fearing such ties would undercut her independence. "I never had any hesitation or regrets in this sense," she said in a 2006 interview. "My life has been enriched by excellent human relations, work and interests. I have never felt lonely." Italian mathematician Piergiorgio Odifreddi said he was always struck by the contrast of this "petite, frail woman and the power of her mind." 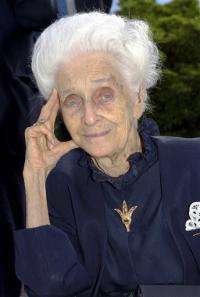 He recalled comments that Levi-Montalcini made when she turned 100. She mentioned that she would sleep no more than two or three hours a night because "I have no time to lose," Odifreddi told Sky TG24. There was no immediate announcement of funeral or memorial services.